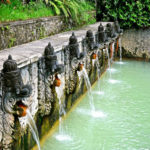 Bali Island has several hot springs and one of them is Banjar Hot Spring or the local people call it Air Panas Banjar. 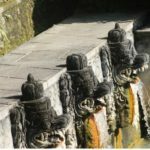 Banjar hot spring is one of the most famous hot springs in northern Bali. Almost every day crowded with visitors, both local Bali tourists, domestic Indonesian tourists and foreign tourists. The first hot water pool is at the top level, this pond has a width of 1.5 meters with a pool length of 12 meters. In the first pool, there are 8 hot water showers with a depth of 1 meter. The second hot spring is below the level of the first pool. The second pool has a length of 12 meters and a 10-meter wide pool. The second pool is the largest of the three pools here. If you are swimming in the second pond, please be careful because the depth of the pool of hot water varies. The closest to the depth of a 1-meter shower and that continues to decline to 2 meters. Because the second pool is the most spacious and has varying depths make the second pool into a favorite hot tub for visitors to swim or soak. The third hot pool is in the west of the second pool and separated from the other pool. There is a shower in the third pool and a shower height of approximately 3 meters. The pool is not deep, just as deep as adult waist and falling water more often used by visitors to massage the back of the rear. 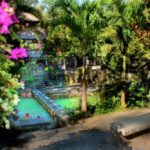 Banjar Hot Spring is located in Banjar Village, Banjar district, and Buleleng regency. It is about 10 kilometers from Lovina Beach You will be charged an entrance fee of Rp 5.000 / adult and children will be charged an entrance fee of Rp 3.000 / children, pretty cheap. The opening hours of the natural warm water pool, from 08:00 am – 06:00 pm.